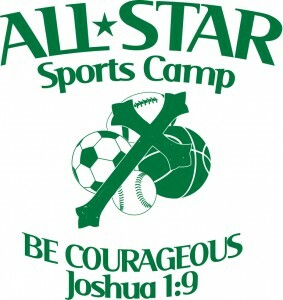 The All-Star Sports Camp is an exciting and innovative way of sharing the Gospel and love of God with children. Some of the children who attend the All-Star Sports Camp may not be able to attend church, but they want to come and learn sports, and at the same time, they also hear about what it means to have a relationship with Jesus Christ. The first All-Star Sports Camp took place in July of 2004 at Alderson Elementary in Lubbock, TX. The Lord has allowed us to host the camp each year. Through the years, we have had close to 2400 youth attend our camp, and many have asked the Lord to lead their lives. Introduce the children to Jesus and a relationship with Him. Plant positive seeds in the lives of the children. If not currently attending a church, help them connect with a church family that will disciple them and help them mature in the faith. Help them connect to role models and adults who genuinely care. Help the children to think positively about their life and future through Christ. Provide them effective tools and life skills. Help prepare the children to make positive life decisions. Create a positive environment and attitude leading into the new school year. Make a positive impact on the communities where the children live and spend time. This year, we are offering our entire volunteer orientation online. We are requiring every volunteer to complete the volunteer orientation. The volunteer orientation will cover: An introduction to sports camp, child safety, how to detect abuse and neglect, how to report suspected abuse, expectations of camp, and how the camp operates. For new volunteers, we are also requiring them to attend a New Volunteer Orientation meeting. We feel it is good to meet face to face with new volunteers so we can answer questions and handle any concerns new volunteers may have. We do not have the dates set for these orientations yet, but there will be three opportunities. YOU ONLY HAVE TO ATTEND ONE OF THESE MEETINGS. IF YOU VOLUNTEERED AT CAMP LAST YEAR, YOU ARE FREE TO LEAVE AFTER THE CHILD SAFETY TRAINING.